With higher density discs and copy protection concerns, maintaining tight control of technical properties and content is vital at every stage of the manufacturing process, from the earliest stages of pre-master content verification through to the final disc manufacture. Measuring is performed using drives where the disc is played and the information is then extracted and processed “electrically”. No more black magic! 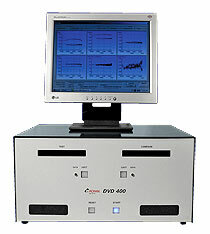 The DVD testers from ADIVAN analyse all the important quality values of a silver disk. Analysers with different complexities intended for different formats and production needs are available for media and stamper analysis.